San Francisco & North Pacific Railroad. Norfolk terminal of the Sonoma Valley Prismoidal as shown in prospectus. S tarting in the 1860s, the people of the Sonoma Valley became interested in their own railroad connection. In 1868, the county voted on a $5000 per mile subsidy to promote the construction of a railroad in their county. When town of Petaluma beat out Sonoma as the teminous for the road, the residents of Sonoma County continued to persue the idea. During 1874 the discussion and want for a railroad had become intense. Joseph S. Kohn came forward to incorporate the Sonoma Valley Prismoidal Railroad using the "Crew Prismoidal One-Rail System". Kohn had been promoting the system along the West coast after witnessing a railroad of this type in use at the Cincinnati Industrial Exposition (1871). Initially Mr. Kohn had promoted the use of this system for rapid transit along Market Street in San Francisco. When his idea failed to gain support, he became determined to demonstrate the system as a viable low cost alternative to Narrow Gauge railroads. Proposed to connect Sonoma with deep water at or near San Pablo Bay, a distance of 7 miles, surveys for the line began on February 17th, 1875. Grading began during June 1876 with construction of 3 and one half miles of grade north from Norfolk. Roadbed was built through the soft coastal soil and required a roadbed similar to local dikes constructed by the Pacific Reclaimation Company. With a base of 13 feet wide, 4 feet tall and 6 feet wide on top the roadbed was sod over a clay filling which reportedly "turned as hard as concrete" when dried. Ditches were constructed along both sides of the roadbed to carry water away from the track and into the marshes it ran through. This first 3 and a half miles also required that five bridges be built, the largest of which was 70 feet in length. 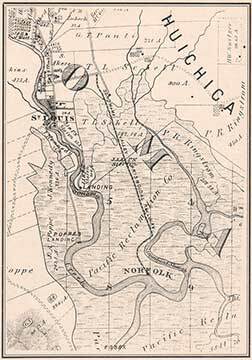 Construction of track began at Norfolk, the railroad's port on August 16th, 1876. 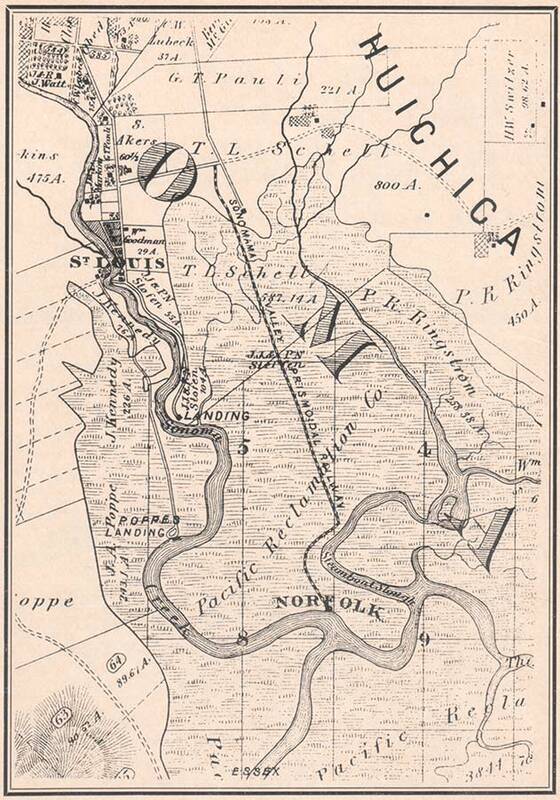 Norfolk, located at confluence of the Third Napa Slough and Sonoma Creek, an area now known as Wingo, was the site of a gathering of railroad buildings including a wharf, warehouse and car-sheds. On November 24, 1876 this first section of track had been completed and the public was invited to come take a ride. A reporter for the San Francisco Examiner was on hand and described that day in an article the following day and was reprinted in the New York Times on December 3rd, 1876. "Yesterday the steam Sonoma conveyed to Norfolk, on Sonoma Creek, a number of our prominent citizens, who assembled to witness the opening of the Prismoidal Railroad. The road commences at Norfolk, on Sonoma Creek, and extends three and a half miles toward Sonoma. The steamer arrived in good season at Norfolk, on Sonoma Creek, the terminus of the Sonoma Valley Prismoidal Railroad, where the party landed, and at once proceeded to inspect the line and the works generally. The Prismoidal Railroad is laid upon a prism of wood built of beveled boards, forming a continuous prism 27 inches wide at the base and 15 inches high, with the single rail laid on top. The car which travels on the line is supported by two wheels, one at the front and one at the rear, with independent revolving flanges. On arrival, the first thing to be done was to test the road, and in a few minutes two platform cars, with a Prismoidal railway locomotive between them, were at the stations. The locomotive is the first of its kind constructed in this State, and was built under the superintendence of George W. Fogg, of the Pacific Iron Works. The party took their places on seats which were arranged on each side of the cars, the passengers being face to face. The first impression suggested was that which ordinarily fills the bosom of the novice who makes his maiden effort to ride the uncertain bicycle. A certain assurance that the whole thing would topple over at the first movement was the general belief of the uninitiated. But the engineer sounded his whistle, the passengers gave their tremulous cheers, and the train moved off smoothly, and soon the pace was considerably augmented. Wonderful to relate, the oscillation was scarcely perceptible, and the locomotive and cars rode the single rail as firmly as the trains on the broadest of English solidly constructed broad-gauges. The faster the train train proceeded, the smaller in number and extent became the lateral oscillations, beautifully and practically exemplifying the great principles of the whole prismoidal system, that the greater the speed, the less the liability to oscillate, a principle clearly demonstrated by the gyroscope and velocipede. To those making their first trip on the new railroad, the case and comfort of this mode of traveling suggest itself most strikingly. The train was run out to the end of the completed line, where forty-five men were found continuing the building of the prism onward. The construction of the road has cost, for the present three miles and a half, including the cost of the road-bed over the marsh, about $4,500 a mile, one-half the cost of the narrow gauge railroad, the most economical of the two rail system. The road was commenced on the 16th of August last by the building of the road-bed." Map of the Sonoma Valley Prismoidal as shown on stock prospectus.With the apparent successful application of the Prismoidal system, a second narrow gauge fever briefly swept over the western states as other regions became interested in using this system and proposals begin to appear as far away as Washington state. Mr. Kohn continued to promote the idea heavily throughout the state. During 1875 Mr. Kohn had begun another Prismoidal line in San Francisco's Mission Bay area to fill in water lots which had been sold by the Central Pacific. This operation reportedly was successful and Kohn returned to his original goal of constructing a Prismoidal system from the Market Street area to Golden Gate Park and Ocean Beach including proposals to build south as far as Half Moon Bay. His idea to elevate the line for rapid transit service seemed plausible, yet once again land owners along Market Street opposed the idea. After seeking cooperative property owners along Mission Street he was again rejected. Ultimately, his bids to construct this line never came fruition; the idea faded off into obscurity of San Francisco's history. Back in the Sonoma Valley, Mr. Kohn had encountered an obstacle that would ultimately cripple the Sonoma Valley Prismoidal. The line had reached the county road at Schell's Gate, while a 2 rail system had no trouble crossing at a grade, the Prismoidal system was prone to difficulty which stemmed from the prism like structure of the track. In October 1876 a patent was issued to E. B. Dorsey of San Francisco for "Improvement In Car Trucks For Prismoidal Track", this patent outlines the current method of grade crossing and the proposed improvemen. In the proposed system, the wooden prism shape and rail ends just before the crossing except for small beveled edge platform which makes up the grade crossing. This beveled edge was designed to hold the larger "drum" wheels of the Prismoidal system in place while the train gently glides across, free of any other track sections which would impede the ability of traffic to cross. As one can imagine, this arrangement proved a less than satisfactory method. Dorsey's improvement was to add 2 rails along the base of the prism as well as modify the "drum" wheels with flanges allowing them to ride the rails. While a slight improvement over the latter, this arrangement would last until the final days of the railroad. Mr. Kohn had purchased 554 acres of land on Sear's Ranch about 1 mile West of Sonoma where he intended for a new town to be laid out. Some grading from the crossing towards Kohn's proposed town was completed however, the grade crossing proved to be such an obstacle that the line was unable to proceed. He continued to lose his battle for a Prismoidal transit system in San Francisco and in May of 1877 Joseph Kohn abandoned the experiment all together, leaving the Sonoma Valley Prismoidal idle for the next year. In July 1878, Kohn formed the Sonoma Valley Railroad with the intention of constructing 3' gauge railroad utilizing parts of the of the Sonoma Valley Prismoidal route. The single Prismoidal locomotive was moved to a building near the present Schellville depot for use driving machinery in a repair shop, but was never used. Joseph Kohn would push the construction of his Sonoma Valley Railroad until late 1878 when financial troubles halted advancement. In 1879, the Sonoma Valley Railroad was taken over by Peter Donahue and his San Francisco and North Pacific Railroad. Over the next few years the traces of the Prismoidal Railway began to vanish from the landscape; the repair shop was torn down and the locomotive sold to an unknown buyer and Prismoidal's sole boxcar was converted into a passenger shelter along the railroad at McGill. In 1889, the San Francisco and North Pacific Railroad began converting their narrow gauge subsidy to standard gauge with the new construction bypassing much of the original roadbed. In 1907 the San Francisco and North Pacific Railroad became part of the Northwestern Pacific Railroad. Today, little beyond a few segments of right of way in use by the North Coast Railroad Authority (NCRA) remain of Sonoma Valley Prismoidal. Crew,Emmor. ; Improvement In Railroads. 1872. Dorsey,E. B.; Improvement In Car Trucks For Prismoidal Track. Dec 5th, 1876. The Sonoma Valley Prismoidal for Google Earth By Andrew Brandon.